Clinton A.K. 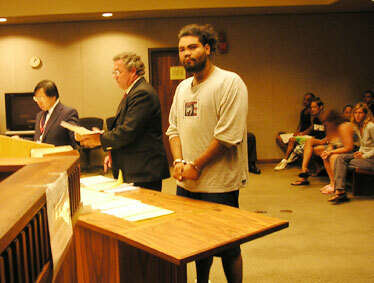 Estrella made an initial appearance Monday in Maui District Court, where he faced a first-degree attempted-murder charge against a police officer. To his right were Deputy Public Defender Gene Evans and Deputy Prosecutor John Tam. WAILUKU » A Maui police officer said he came within seconds of being run down by Clinton A.K. Estrella twice -- once in a parking lot in Paukukalo and another time during a high-speed pursuit in Kahakuloa. Officer Brandon Rodrigues said he moved out of the way twice and eventually assisted in Estrella's arrest. "I definitely would have been run over," Rodrigues said during a preliminary hearing yesterday. Maui District Judge Simone Polak found there was sufficient evidence to have Estrella, 23, stand trial for felony charges, including two counts of first-degree attempted murder. He is scheduled to be arraigned at 8 a.m. Aug. 12. Polak continued an order to hold Estrella without bail. Estrella also faces other charges, including first-degree criminal property damage, driving without a license, resisting an order to stop a motor vehicle, reckless driving and resisting arrest. The Prosecutor's Office had initially charged Estrella with one count of first-degree attempted murder. Maui police were called at 10:30 p.m. Friday to Kamehameha Preschool's parking lot in Paukukalo, where, according to an anonymous caller, a man had brandished a handgun. Rodrigues said he ordered Estrella from his car in the parking lot. "I kept on ordering him to stop and get out of the vehicle," he said. Rodrigues said as he approached the car, it began moving in reverse and he moved out of the way. He said the driver tried to squeeze the vehicle past Rodrigues' police car and the entrance and sideswiped his vehicle on the driver side. Rodrigues said the chase went up to about 60 mph through residential and business areas of Wailuku, then toward Kahakuloa in northeast Maui. At one point, after the car missed a turn and stopped, he got out of his police car to approach Estrella, Rodrigues said. But Estrella put the car in reverse again, nearly hitting him. Rodrigues and other officers continued the pursuit. Estrella was captured by several officers, after his car went off a 40-foot embankment into trees.